SHENANDOAH CAVERNS, VIRGINIA: Surrounded by the Blue Ridge Mountains, Shenandoah Valley is a fantastic getaway for the locals and tourists. This is a place for the nature lovers, photographers, hikers, bikers, campers, or just curious minds. 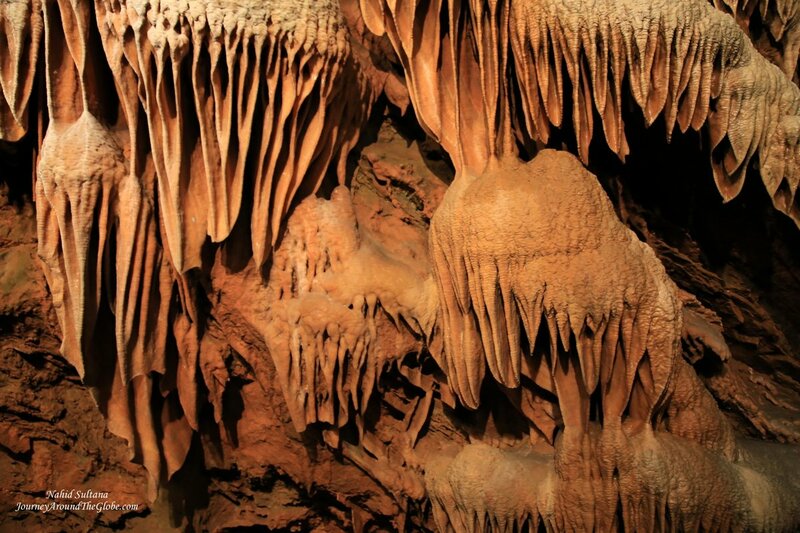 We have been to Virginia’s famous cave Luray Cavern quite a few times. When my sister bought the tickets for this Shenandoah Caverns, we thought they were the same place. But luckily that wasn’t the case. 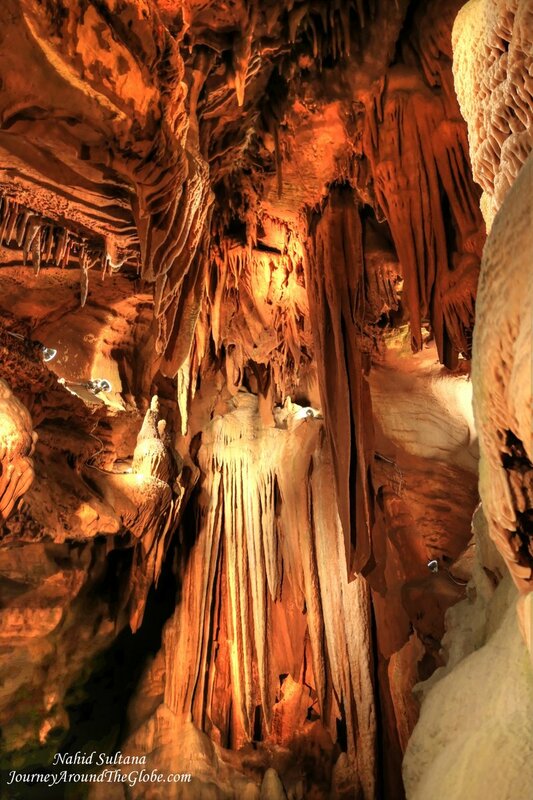 Shenandoah Cavern is a different site which even many locals don’t know about. It was good because we’ve never been to Shenandoah Caverns before and I was eager to see something different. TIME of TRAVEL: It was the mid-July of 2014 when we moved back to The States from Europe after three years. We stopped in Baltimore to my parent’s before flying to Oregon. Drive from Baltimore to Shenandoah was close to three hours. After entering Virginia, you slowly see the curves of Blue Ridge Mountains and the small valleys. It was a nice scenic drive all around. It was initially a nice day when we started driving towards the cave but turned to a gloomy day at the end. PLACES WE’VE VISITED: Shenandoah National Park is probably one of the major attractions in this region. If you take the Skyline Drive towards Luray Cavern, you get a fantastic view of the valley and surrounding Blue Ridge Mountain range. But if you are like me who has been to Luray Cavern many times, maybe next time you can try Shenandoah Caverns. – SHENANDOAH CAVERNS (Family of Attractions): Shenandoah Cavern is an underground world of wonder and excitement for children and adults. Every “chamber” of it has breathtaking spots and miracles. 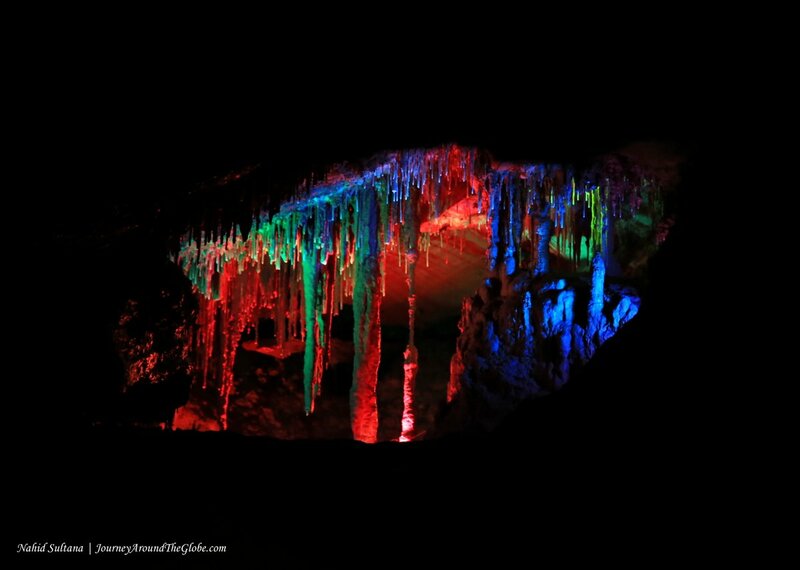 Many of the geological formations have been named and are displayed with different types of lighting. This is the only cave in Virginia with elevator service and therefore, tourists in wheelchair can roam most of its sections without any problem. The cave was discovered in 1884 and was open to the public in 1922. The deepest point of this cave is 220 feet. Last major earthquake inside this cave was around 7,000 years ago which changed some shapes of the rocks and formations. 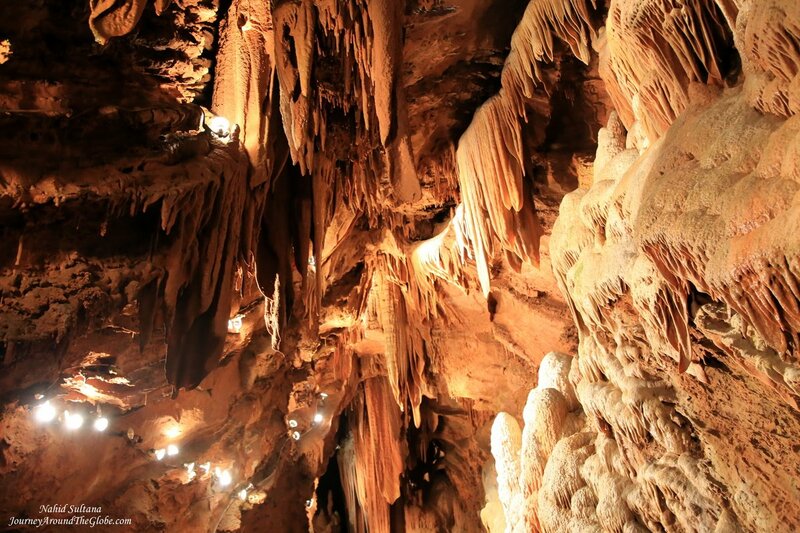 Shenandoah Cavern tour is a mile long walk with a guide. Small pools, wishing wells, stalactites, stalagmites, popcorn rocks, high ceilings, and different sizes, shapes, and colors of rocks will make every tourist to gaze at these beauties in awe. One of my favorite spot was the Reflection Pool with rainbow lightings…absolutely looked like a fairy-tale scene out of a book. Ticket to Shenandoah Caverns Family of Attractions is $23 per adult and $10 for children 6-14 years of age. This is a package price for the cave, American Celebration on Parade (Parade Float Museum and Model Train Exhibition), and The Yellow Barn for daily wine tastings, agricultural exhibitions, and seasonal live beehive. Caves are such lovely things. Great pictures. Thanks for sharing! Always enjoy exploring caverns whenever I get a chance. Fascinating!